19th-century full blue-black morocco blind-stamped binding by Rivière, in retrospective Parisian style of the late 15th to early 16th century, leather hinges, inscribed on spine: Preces/Piae/M.S. Gift of Julia Parker Wightman, April 1993. Purchased by Julia Parker Wightman from Harry A. Levinson, Beverly Hills, CA, in 1958; JPW 3478; given in April, 1993. 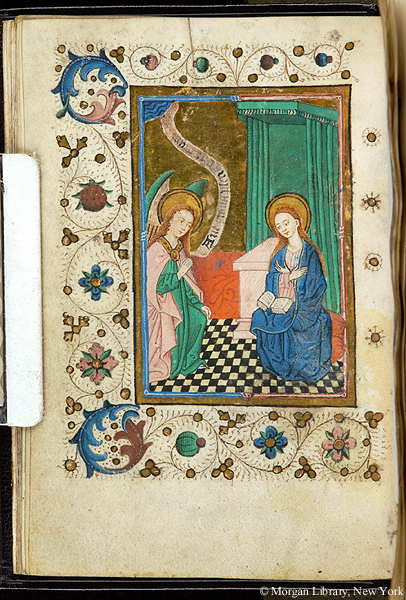 Ms. book of hours, use of the Augustinian Canons of the Windesheim Chapter (Hours of the Virgin, Long Hours of the Cross, Hours of the Holy Spirit, Hours of the Eternal Wisdom, Office of the Dead); written and illuminated in the Netherlands, possibly Zwolle, ca. 1470-1480. A contemporary inscription giving a date, framed by a gold rectangle, is found on the otherwise blank fol. 13, falling between the calendar end on 12v and the blank folio 14: In iaar Duysant iiii &[?] xxix (1429?). Decoration: 6 full-page miniatures, 6 large and 28 small decorated initials, 40 decorated borders. Artist: Masters of the Zwolle Bible.